We all want a bedroom that our kids can use from being a baby until they grow up as a teen. Having this kind of space will help us save money as well give more value to the bedroom. For sure, the kids will be able to store many fond memories in their private hubs too. That would be amazing if that particular bedroom was used since 0 years old to the present. Your kid will love that idea! Bedrooms from Kibuc are perfect because aside from being functional, they can offer a space for an infant to teenagers. Actually, they have some bedrooms for families and singles too but I just found the teen bedroom category fascinating because of the burst of colors we can see in them and how each space was designed and organized. We gathered some of these bedrooms below which is shown according to age of the prospect user. Create a pretty environment with colors and shapes like what we can see in this bedroom. It used White Melamine and Yellow Textured finish. 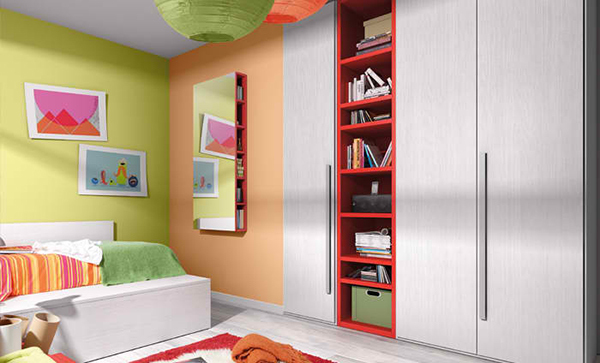 Store toys and books in colorful storage areas for a bright colored bedroom of decape melamine, textured white, fuchsia, apple green, dark purple and light orange. This one has furniture that grows with your child having a cot bed, wardrobe and others. A practical and young room with lime, fuchsia, cyan and white colors. It has a train nest with bunk bed, wardrobe and drawers perfect to store your kid’s stuffs. Two sisters will enjoy this bedroom composed of a play area with tables and chairs. We love the colors too! A pretty modern bedroom of pink and white! What I see is beautiful clutter! L-shaped beds are ideal for two sisters. Small talks before bedtime will surely be more enjoyable. The Melamine maple, eggplant and fuchsia finishes are very lovely! A cheerful and outgoing teen’s bedroom comprised of a study and sleeping area. The bed has a trundle bed with drawers. This one has corner cupboard doors with shelves terminal, horizontal shelf with cubes and a trundle bed. Lime pore and white colors are used here. A comfortable and cheerful bedroom with study areas and several shelves and storage areas. A fun room with plenty of storage possibilities from a 3-door wardrobe, shelves to a mirror-integrated shoemaker. Fit for your little man with practical and functional design. I like this one because of the graffiti on the wall for a street themed bedroom. Young people who are seeking independence will certainly get just that in a bedroom like this with everything they need. Mora, Papyrus and Vulcan finishes are used for this bedroom for a young person who is full of energy! A space like this would be totally awesome with a close-room that is clear and free. Beautiful bedrooms! For sure children who will have a bedroom like this will be totally thrilled and happy! Kibuc.com could really provide us with the perfect bedroom for our little ones until they grow up as teenagers. How cool could that be?